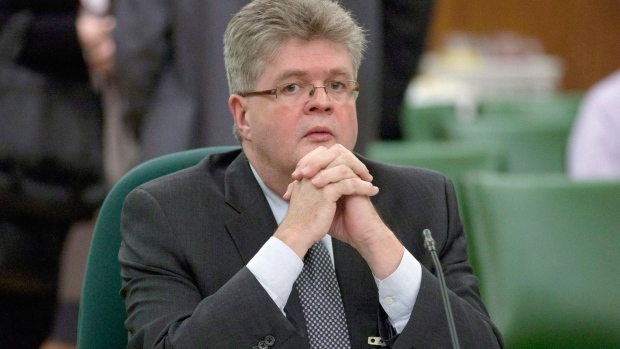 OTTAWA - Canada's ethics watchdog says he would like to have greater powers to impose penalties against cabinet ministers and public office holders who violate conflict rules, including the ability to levy fines of up to $10,000. Dion determined that LeBlanc knew his wife's first cousin was involved in the Five Nations Clam Co. and also knew the cousin stood to benefit financially when awarding the company a multi-million dollar licence last February. Rex Matthews, mayor of Grand Bank, N.L., says LeBlanc should resign or be removed from cabinet for his role in the licensing deal, which the government has since halted but would have ended a monopoly on the Arctic clam fishery held by Clearwater Seafoods, located in Matthews' community. “He should have known, if there's any possibility of a conflict of interest, you should remove yourself,” Matthews said from his home in Newfoundland. The Conflict of Interest Act came into effect in 2007 as part of the Harper administration's Federal Accountability Act, which came in the wake of the Liberal sponsorship scandal of the early 2000s. No penalties exist for infractions like LeBlanc's - except the act of exposing the actions by way of a report, Dion said. But the act does not permit the commissioner to recommend anything. That's something Dion would like to see changed. “I think this is a central issue with the act. The buck stops with the report. Then it's completely up to politicians to make decisions and I'm not even able to express a point of view about that,” he said. Dion says he believes it's an issue of fairness to everyone - both for those who break the rules and those who do not. Last year, then-commissioner Mary Dawson found Trudeau broke Canada's ethics laws over two all-expenses-paid family trips to a private island in the Bahamas owned by the Aga Khan. Trudeau also had to pay a $100 fine earlier this year for failing to disclosing a gift of sunglasses from the premier of P.E.I.